When my grandmother left Canton (now called Guangzhou), China in the year of the Canton uprising to make her way, first to Hong Kong and then, to British colonial Singapore, she brought with her, not only knowledge of traditional herbal medicines but, her deep prejudices against female children she considered to be 'rice barrels who are nourished to serve others'. The Thorn of Lion City is a glimpse into a world of Chinese tradition and superstition where my grandmothers almanac meant punishment for the sins of a past life or exhausting penance to obtain deliverance from a difficult existence in the next life; where animal charts and astrologers led to the giving away of my newborn sister because there was a clash of signs; and where even some of the little things like winning at mah-jongg or the big things like our fate, depended on my grandmothers divination sessions at the local Chinese temple where the deities answered her questions. In telling my story I have explained and demystified many of the Chinese customs and traditional ways practised in my family. The setting of my memoir is Singapore in the forties when the streets were alive with market stalls and bazaars and hawkers shouting out their wares, and European tourists staring awe-struck at open-fronted funeral parlours filled with corpses amidst food stalls catering for mourners and tourists. This is also the period when Singapore waited for the invaders, the Japanese, and then suffered under their occupation. The book is dedicated to my father who had succeeded in protecting his family from the Japanese occupiers' persecution of the Chinese in Singapore but was powerless to stop my grandmother's and mother's brutality. 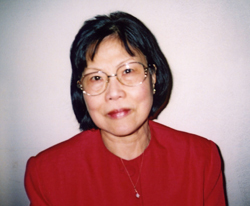 "In modestly elegant prose, Lum portrays the lean, hard years during which she must navigate the crushing adult forces around her and bear witness to horrible events ... Lum's work resonates with power and grace." "Essential for all large libraries, this will enrich multicultural and memoir collections of all sizes." 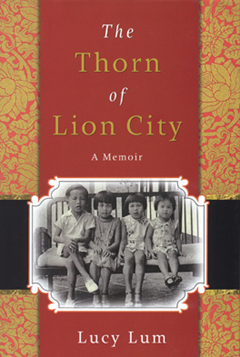 "The Thorn of Lion City is a truly magnificent memoir. It contains equal parts death, delight, dread and hope-the sort of stuff that keeps one reading late into the night ... an immense and touching book." her work stands out from them because of its deep concern for mistreated women."